The free Nikonians mGallery app for the iPhone is now available. 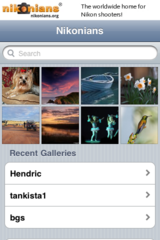 The app makes it easy to showcase your own photography portfolio on your Apple iPhone or iPad. The application is free of charge and can be used by all Nikonians members. All users, even non Nikonians, can browse and bookmark existing galleries. As a registered member, you can login and connect to your own gallery. Download and save, plus emailing of images is also possible for registered, logged-in members. The Nikonians event of the year, actually the event of the decade with Nikonians turning 10 years old, ANPAT 10 is about to take place early September. A week full of activity from dawn till dusk, prizes, chit-chatting with the founders, loads of fun, learn other hard-core Nikonians and shoot, shoot and shoot! Last seats available - we have hard limits on the number of participants - so book ANPAT 10, the event of the decade now. Nikonians, the largest community for Nikon photographers, always have various positions open, both for volunteers and staff. Check out our open positions page for more information. Congratulations to the winners of our Nikonians 10th Anniversary Photo Contest. The Grand Prize winner not only takes top honors, he also manages to be the subject of one of the Honorable Mention images. Grand Prize honors go to "3 Nikonian Amigos on the Caribbean Road" by Gold member Richard Hulbert (rhulbert), from Vancouver, Canada. He made his winning image with a Nikon D3X camera using a 14-24mm f/2.8G AF-S set at 16mm. The aperture was f/5.6, the shutter speed was 1/8000s. 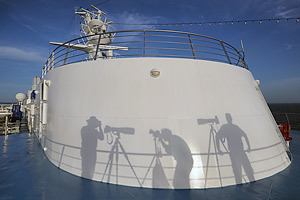 "We were all part of the Nikonians Academy inaugural Ultimate Travel Workshop in the Caribbean led by Michael Mariant. The shadow on the left is me taking the photo. Just to the right of me in the photo is my MAGICA from the Nikonians' Photo Pro Shop (modified with a Wimberly Head) holding up my D3-500mm f/4 combo. I was getting ready to shoot the sunset...and hence the low sun angle casting the shadow. The middle shadow is David Mathre (david_mathre). On the very right is Albert Esschendal (alberte) ...both die hard Nikonians. Dave and I each think that we suggested the three of us turn around. The great thing about shooting with guys like Albert and Dave (and other Nikonians) is that we help each other with finding possible shots. We laugh together, we learn from each other and we, of course, get inspired by one another. The lesson here is to try to be aware of your total environment as you concentrate on the subject at hand. More often than one would expect, I have simply turned around and found a visual surprise!" 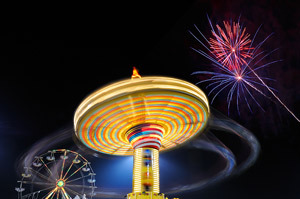 "A World of Fun" by Gold member Jeff Meyers (jeffmeyers), takes Honorable Mention. Jeff subtitled his winning entry: "The Nikonians community is a carnival of coolness!" It was taken with his Nikon D300, using an aperture of f/11 for an exposure lasting 1.5 seconds. The ISO was set to 200. The second Honorable Mention goes to "Rick H Death Valley" by Platinum member Rick Paul (rickpaul), from Arizona, USA. 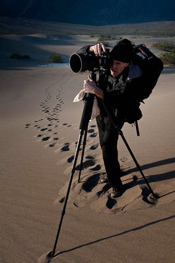 His winning entry was subtitled: "Nikonian Rick Hulbert shooting the Dunes in Death Valley"
The image was made with a Nikon D3, his lens @ 35mm, f/11, 1/60 sec, ISO 200. The Grand Prize for Richard Hulbert will be will be an exclusive "One-on-One" workshop with an International award winning photographer Pascal Baetens in Brussels, including air ticket and hotel accommodations. He will also receive a Plaber Case HPRC 2780W and Foolography Wireless GPS Bundle. Jeff Meyers will receive a Plaber Case HPRC 2600W, Epson Stylus Photo R1900 Ink Jet Printer, a Gorillapod SLR-Zoom support and Foolography Wireless GPS Bundle. Rick Paul's prizes include a Plaber Case HPRC 2550W, Epson Perfection V500 Photo Scanner, Gorillapod SLR-Zoom support, and Foolography Wireless GPS Bundle. Congratulations to the winners of our fourth and fifth week in the Nikonians New Members Welcoming Photo Contest Phase VI. Week Four honors go to a new member from the Netherlands, and Week Five's winner comes from Brazil, and posted shots taken in Scotland. Our flying boy shot is submitted by Silver Member Maurits Obbema (Maupey) from the Netherlands. 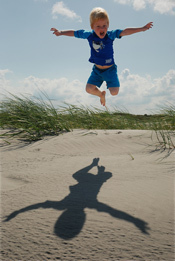 He tells us the 4th week winning shot was made on one of the Dutch islands and confirms: "It's my son trying to fly." 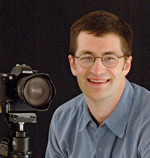 He was shooting his Nikon D80 with an ISO of 100, an f/4.5 aperture and froze the image with a 1/1600 sec shutter speed. Maurits has been shooting digital for a long time, first with a COOLPIX and now with his D80. Our 5th Week winner is Silver Member Eric Emerson (eemerson) from Brazil. His image is titled "High School Sweethearts -2009" and it was taken in Scotland. "Hey - Here is a picture of a young couple getting ready to go to their Junior-Senior prom in May 2009. They were juniors then. They have been dating since the 9th grade, they are seniors now and are getting ready for the prom again. This location is called Johnston Gardens in Aberdeen, Scotland. It's beautiful, tranquil little park tucked away in the city. Springtime here is fantastic!! I liked this picture because of all the different colors in the background, in addition the various tones of green. 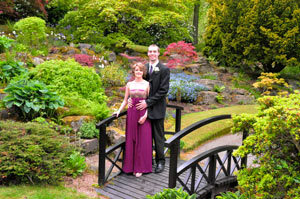 I like how they and the bridge are in the foreground and the plants provide such a vivid backdrop." He used his Nikon D300 and Nikkor 18-200mm f/3.5-5.6G IF-ED lens with an aperture of f/10, 1/125th sec shutter speed, ISO 3200. The camera was mounted on a Manfrotto 055XPROB tripod with 486RC2 head. <-- The shooting location in Scotland may be hard to guess at first glance and if you need a better visual clue on that location, check out his shot from this year's prom, with the young man now wearing the traditional Scottish kilt. Both of our winners earned a Topaz Photo Shop Plug-in Bundle, courtesy of our sponsor Topaz Labs. Congratulations to our winners in the third and last round before the finals of the Nikonians 10th Anniversary Photo Contest. Richard Hulbert (rhulbert), Paul Ekman (pdekman) and Kenneth Fok (zedbadee) combined to share with us scenes from the 14-Day Ultimate Travel Workshop in the Caribbean, the 9th Annual Nikonians Photo Adventure Trip (ANPAT) in Alaska — and China. First Place honors go to "3 Nikonian Amigos on the Caribbean Road" by Richard Hulbert (rhulbert), from Vancouver, Canada. Rick is a Charter Member -with Nikonians at least from 2005. 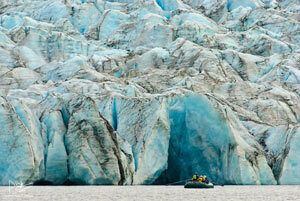 To "Nikonians at Spencer Glacier", by member Paul Ekman (pdekman) from Iowa, USA. Paul has been a Nikonian since 16th Nov 2005 and made this picture with his Nikon D200, 70-200mm/f2.8F AF-S VR with TC14E at 280mm, f/8, ISO 400. Images from Spencer Glacier were a popular feature of the 9th ANPAT, including one action packed close-up which made the front cover of one of our Nikonians eZine magazines. 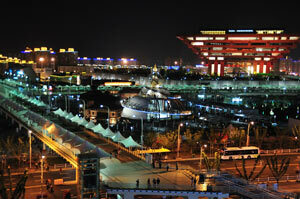 And to "Nikonians in China" by member Kenneth Fok (zedbadee) from British Columbia, Canada. 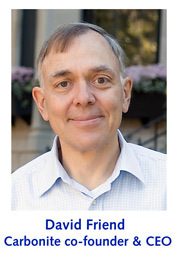 Kenneth has been a Nikonians Member since June 2007. - A Photo Pro Shop USA voucher for 10% discount on any purchase above $50 within the next 12 months. You can look at all contestant images in the 10th Anniversary Contest Galleries here. We will provide the finals winners details in the Nikonians Photo Contest forum, in our News Blog and your free Nikonians Newsletter. Rick and Jason discuss the increasing popularity of smart phones as camera accessories, review the Think Tank Retrospective Bags, and offer another edition of "the back story." Photo Prescription: Make a photo book! Get a free gift from Think Tank Photo when you order using this link. The newest edition of The Nikonian, our official nikonians.org magazine is available for free download and features a look at photography through multiple perspectives. This issue includes crime scene photography, getting started with infrared shooting and an excerpt from Nikonians Image Doctor Jason Odell's latest eBook. Our iPhone app Good Locations allows you to spontaneously share good shooting locations with other photographers. Now we also have our Good Locations Website where you can search and filter for locations around the world. The iPhone app and the website is based upon Nikonians motto: To share, learn and inspire. As a community, it is important that we do not only learn from each other, but that we share what we know as well. Only by sharing our knowledge, and our locations, that good stuff we'll grow as photographers and also become a better community. You will notice that the website is in an "early access" stage, which basically means that we are working on it. We are going to improve it over time, introducing features such as upload of locations directly through your browser, from the Nikonians galleries and to be able to comment and give feedback on locations. If you are logged in to the site, you can edit your own images and you need to use the login credentials you used when you first used the iPhone app (typically your Nikonians username and password). We will also provide good locations apps for other smart phones this year. Google Android is one of them. We are removing postings we believe are not providing any real value, such as shots of your office desk. If you feel you need to do a test, then flag that location as a "bad location" by selecting the sad smiley in the app when you post it. Also enter the comment "test" or similar in the comment field on that contribution. So, please go ahead and use both the app and our Good Locations Map website and go and and scout for new locations today. Each year on the occasion of the first big Holiday of the Summer in the USA we're all sharing tips and tricks. This year we have the highlights compiled for you in our English Café. Enjoy the weekend and share your shots!